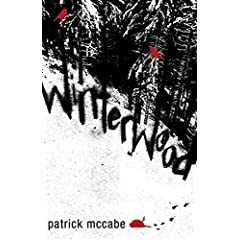 Patrick McCabe’s haunting novel “Winterwood” begins charmingly enough with our narrator Redmond Hatch telling of his time revisiting his old mountain home in Ireland and reveling in the tall tales of the proud local drunk, Ned “Auld Pappie” Strange. There’s an almost instant undercurrent of dread to the storytelling as we quickly become aware that neither Ned nor Edmond are going to be very reliable narrators, both soon overcome with the dark secrets and the Banshee ghosts of their pasts. Ned, it seems, my not be so innocent a weaver of tales, and Redmond is crippled by a crumbling marriage to a woman he is madly in love with and a troubled childhood he can’t seem to escape. McCabe is a master of writing dialogue in local dialect, as I often found myself reading out loud the early stories of Ned Strange and speaking in a rather effective Irish accent. Even more so, McCabe is a master of stark, economical writing. Shocking details come quick and fast, presented nonchalantly as the story progresses so that they soon fester in the mind of both the reader and the narrator until they creep back into the narrative in horrifying ways. There are times when the narration becomes a challenge to follow, as the book becomes rife with name-changes, locale-switching, and no apparent chronology to the order of events. Even the chapter titles and time and place headers become deceptive, as once lost inside Redmond’s head, all becomes jumbled in half-truths, lies, exaggerations, under-statements, and grotesque speculations. Still, McCabe is able to ground things with simple passages that are both lyrical and haunting in their slim descriptive power. By the time you finish visiting “Winterwood” you are left with the singularly unnerving feeling of being chilled to the bone. Hell, it seems, is a cold, cold place where the devil can’t wait to shelter you. This entry was posted in Book Reviews, Books, Literature and tagged Ireland, Irish Writers, Novels, Patrick McCabe, Psychological Thrillers, Winterwood.